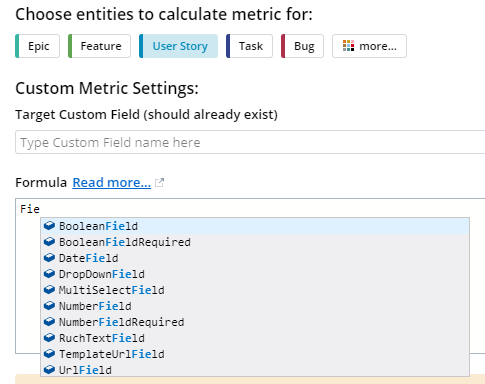 Today we are happy to announce the new editing experience for custom formula metrics! This feature includes powerful suggestion and auto-completion modules which provide helpful assistance when using metrics DSL (domain specific language). These metrics allow to you define a formula that will be automatically calculated for all Bugs, User Stories, Features, and other entities. The results of these formula calculations can then be used in other parts of Targetprocess — on boards, details views, aggregation reports, and even outgoing webhooks. This makes custom formula metrics a huge part of various automation and reporting scenarios. Our largest customers tend to have more than 100 unique metrics configured in their accounts. Thus, having a smart and helpful formula editor is an important improvement. Let’s take a look at some of its major features. The editor now starts providing suggestions as soon as you start typing a formula. Pressing Ctrl+Space (^Space on Mac) also triggers a suggestion popup. The suggestion module knows how to display various aggregation methods available on Collections, such as Where, Select, First, etc. Our long-term users may remember the old days when we used formulas like CustomValues["SomeField"]. Well, not anymore! Custom fields can be used directly via the field name in a formula now. Our more technical readers may recognize the editor from the screenshots above — it’s Monaco editor, which originated from Visual Studio Code. The auto-completion logic for the new editor is powered by ANTLR, which defines formal grammar for our Targetprocess DSL. ANTLR tools let us analyze the parse tree produced from the formula text to build specific suggestions, like the name of the fields and functions available to the end user as they type into the editor.